Each day our Parapan Am Games field reporters Jacqueline Doorey and Caroline Calve will go behind the scenes and reveal new and cool things that they've learned. Each day our Parapan Am Games field reporters Jacqueline Doorey and Caroline Calve will go behind the scenes and reveal new and cool things they've learned. 1. 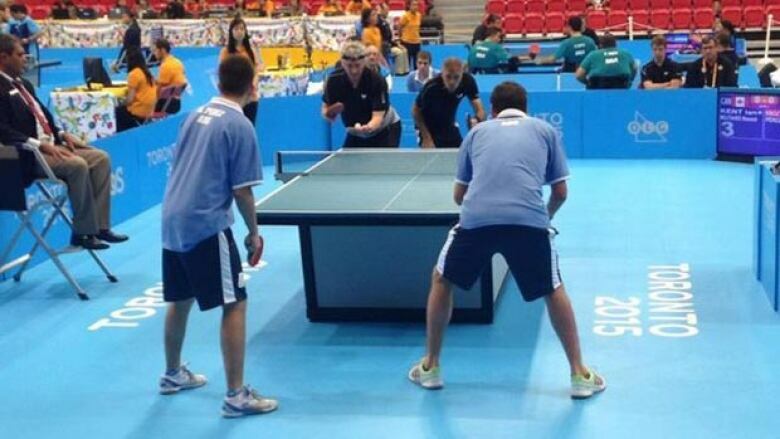 In doubles table tennis, one player will signal to their partner under the table what kind of serve they're going to do: a serve with a top spin or back spin, etc. That way, their partner gets an idea of what kind of return shot to expect. 2. Canadian women's basketball head coach Bill Johnson is the older brother of famous wheelchair basketball player Joey Johnson. Joey is considered one of the best power players in the world and has the medals to prove it. The quintuple Paralympian has helped his team win back-to-back gold medals in 2000 (Sydney) and 2004 (Athens) Games. He was also part of Canadian teams that won silver in 2008 (Beijing) and gold at the 2012's London Paralympic. Canada's wheelchair basketball team has suffered from Johnson's retirement in 2012, but is undefeated at these Parapan Am Games. Will the Canadians make it to final and qualify for Rio 2016 Paralympic? Stay tuned! The finals takes place on Saturday. 3. Wheelchair rugby is a rough sport. Players run into each other all the time…and pay for it! They can burst up to six tires a game. No time to change a flat tire. They bring extra wheels to games. 4. Every Parapan Am venue has family friendly Paraplay zone's where you can try out the sport showcased at the venue.